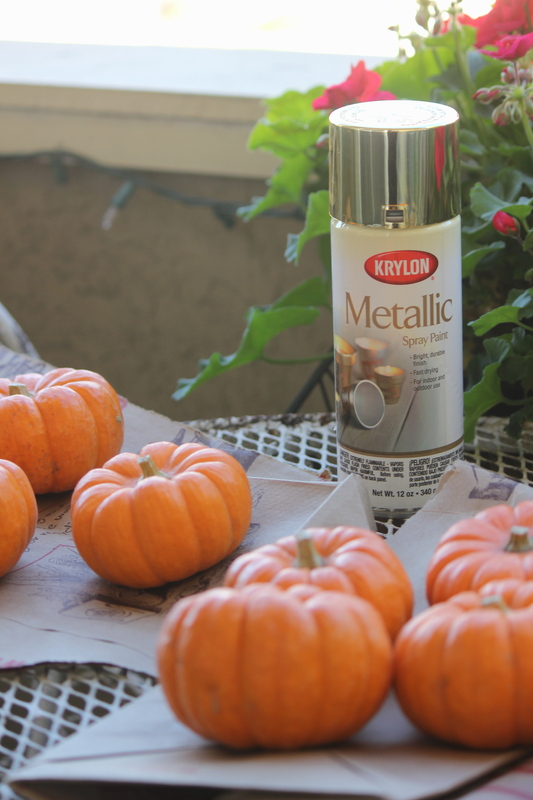 Now that Halloween is done, time to pack up the pumpkins and get out the Christmas decorations- right? WRONG!! Did someone just forget to tell Pier 1 about the best holiday of the year?? Don’t get me wrong, I love decorating for Christmas, but Thanksgiving will always be number one for me. 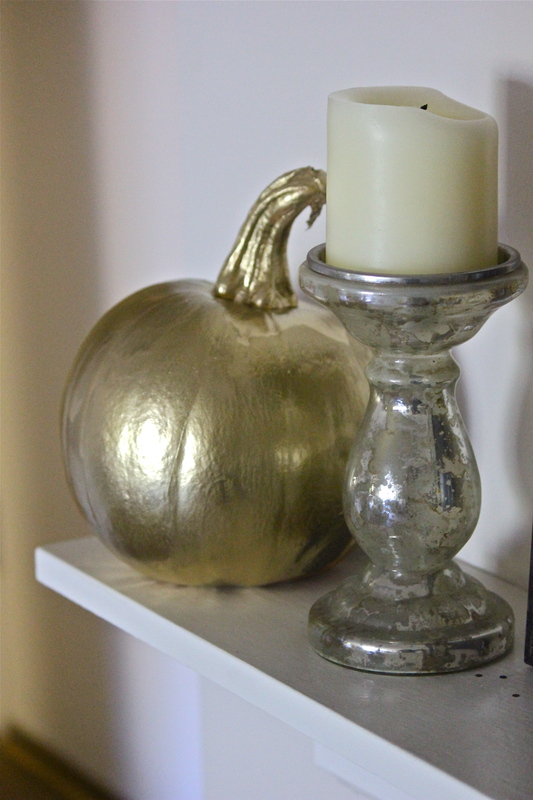 A simple, cheap and easy way to transition from Halloween to Thanksgiving is gold spray paint. 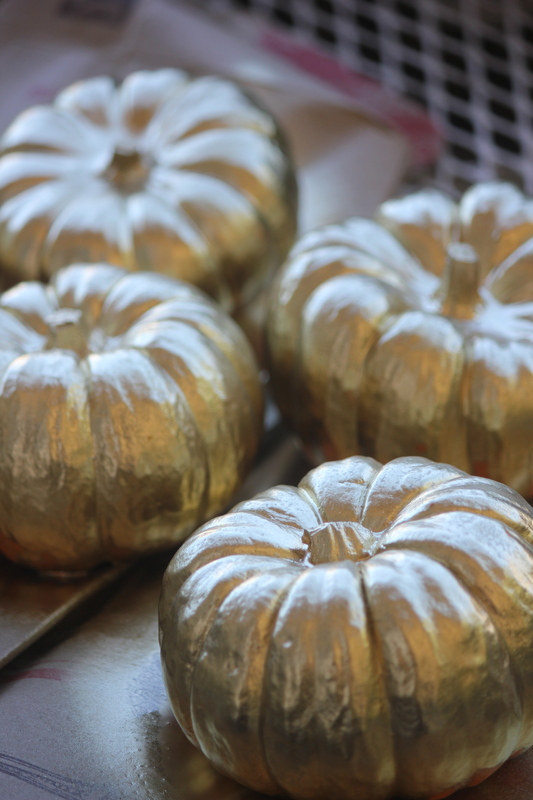 No need to get rid of all the fabulous pumpkins you gathered for the trick or treaters – just give them an elegant makeover for the pumpkin pie eaters! Have I mentioned that I love fall? 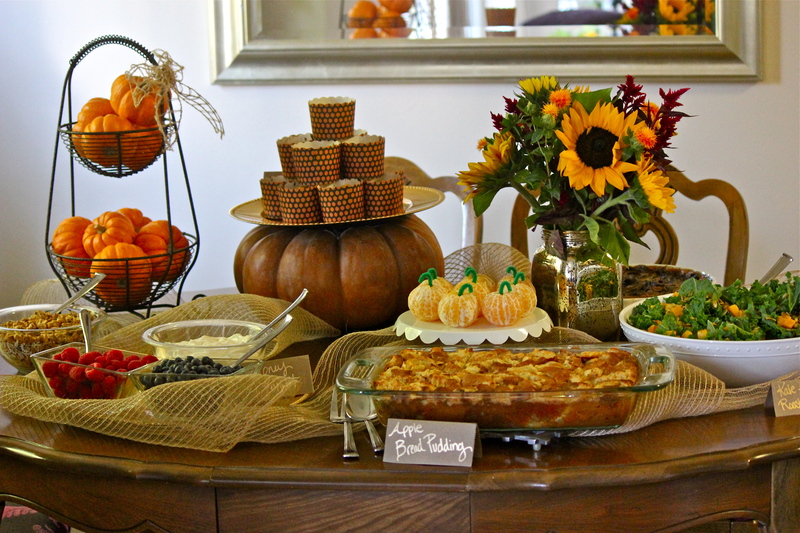 With fall comes so many decorating and baking opportunities, and this weekend I had the pleasure of hosting the “Girls in TV” brunch! Planning a menu for a bunch of women in general can be tricky – but especially so for a bunch of women producers, in Los Angeles! Talk about a carb free, gluten free, dairy free, alcohol free, nut free, headache! Good thing I really like these girls. 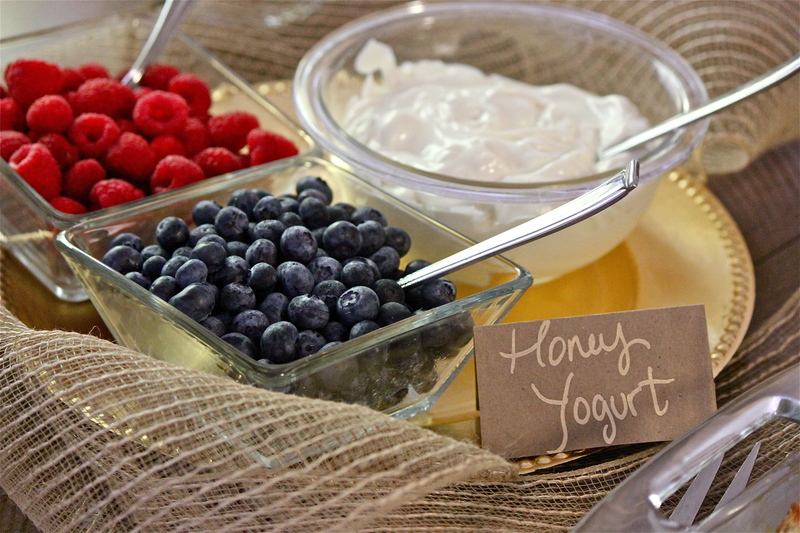 So I kept a few fully loaded favorites and snuck in a few more healthy options as well. 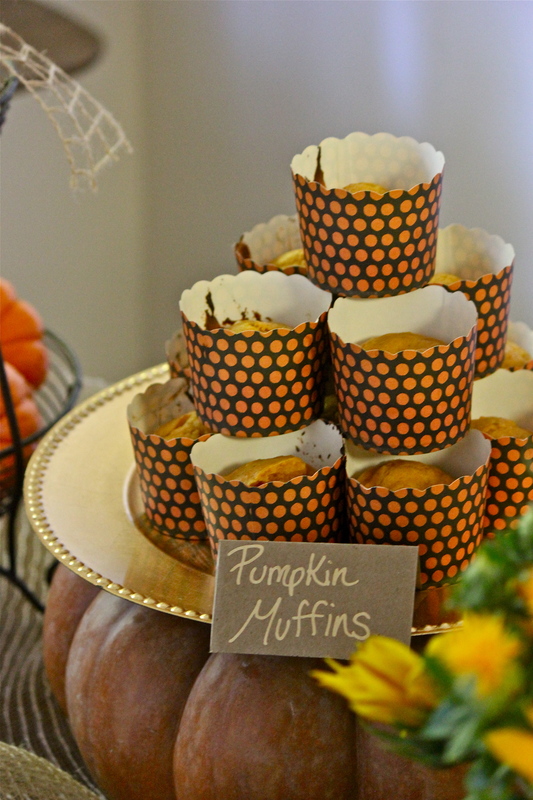 You can’t have a fall brunch without a pumpkin flavored item – so I went with this great pumpkin muffin recipe by Something Swanky http://www.somethingswanky.com/pumpkin-pudding-muffins/ The best secret ingredient ever? Instant Pumpkin pudding mix! So this might not be one of my healthy options, but it tastes damn good. 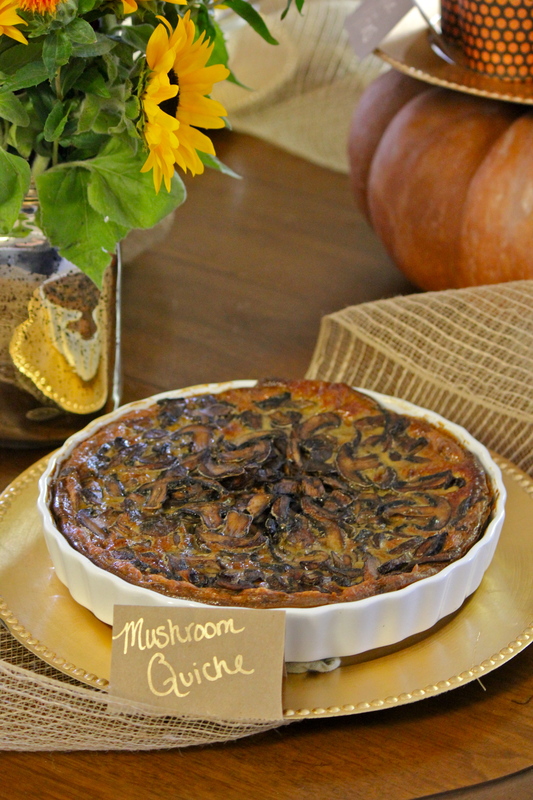 I changed just a few things to Martha’s recipe – I took out the shallots (for selfish reasons – because I hate anything to do with onions…I know), I used half and half instead of the full cream, I sautéed the mushrooms first and drained the extra liquid, and I FORGOT to add the fontina! Whoops! But when I brought the left overs in to work one of my colleagues asked what kind of cheese I used because she loved it. Guess I lucked out – or it doesn’t need the cheese. Ok so for the healthy guests, I set out berries and honey flavored yogurt and made the cutest tangerine pumpkins with pipe cleaner stems! I also served a kale salad with roasted, diced butternut squash and goat cheese (On the side of course). 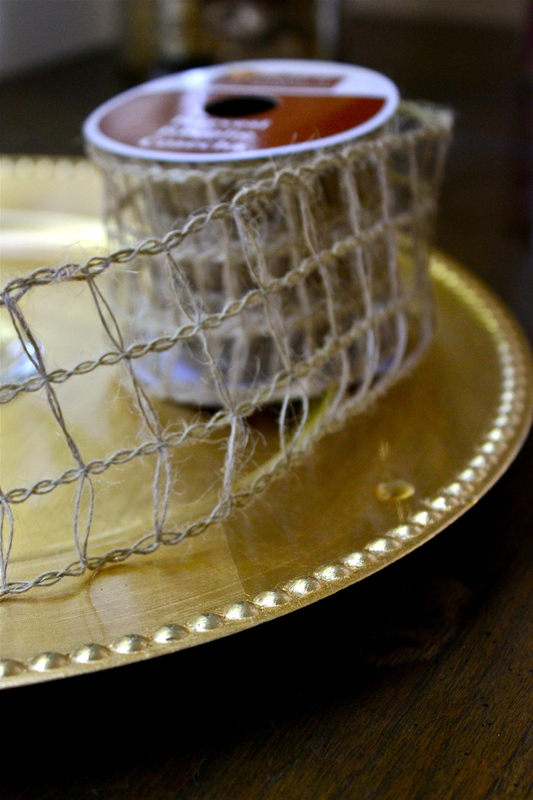 A great ways to frame all the food you’ve prepared is with a natural fiber mesh- with wire, so you can bend and twist it around each dish. 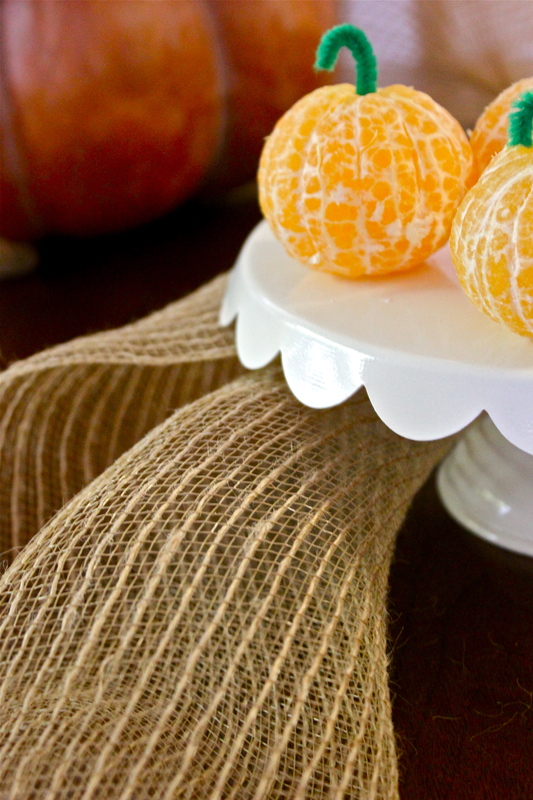 It’s a great alternative to a table cloth- which seems dated at the moment. 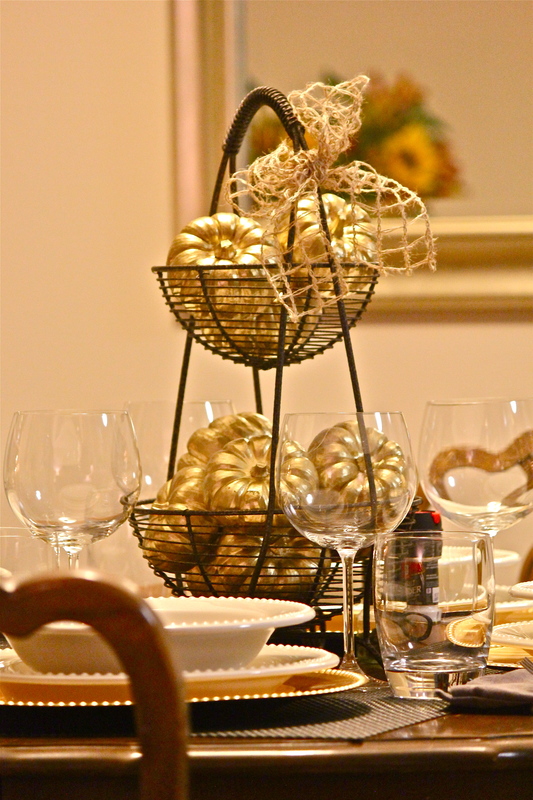 I also love using chargers to bring a pop color (in this case gold) to your table. I found these plastic ones at sur la table and bought them in both gold and red. Ok yes – my blogging has slowed… or stopped rather. I confess, this idea of the balanced career woman isn’t as easy to master as I thought! But, balanced is the key word here; so while my career life has picked up (yey), I’m going to try and share some of my crafting and cooking adventures when I can. 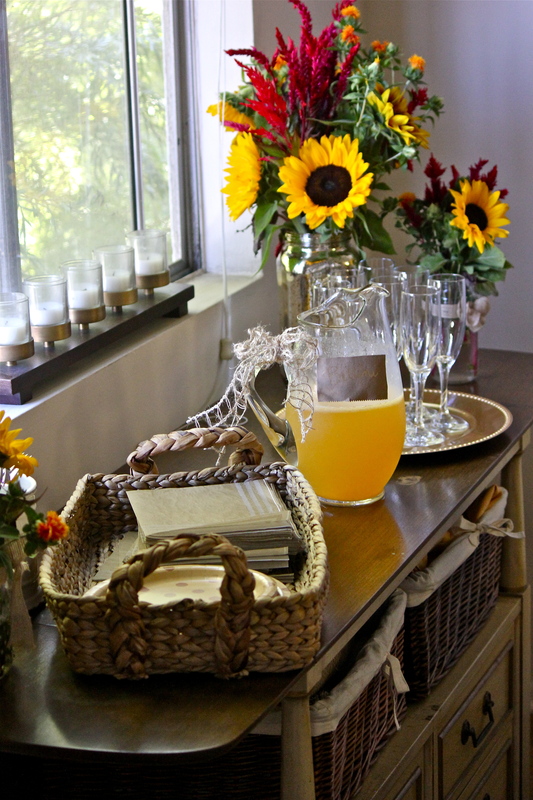 I blame Fall for this blog resurrection. 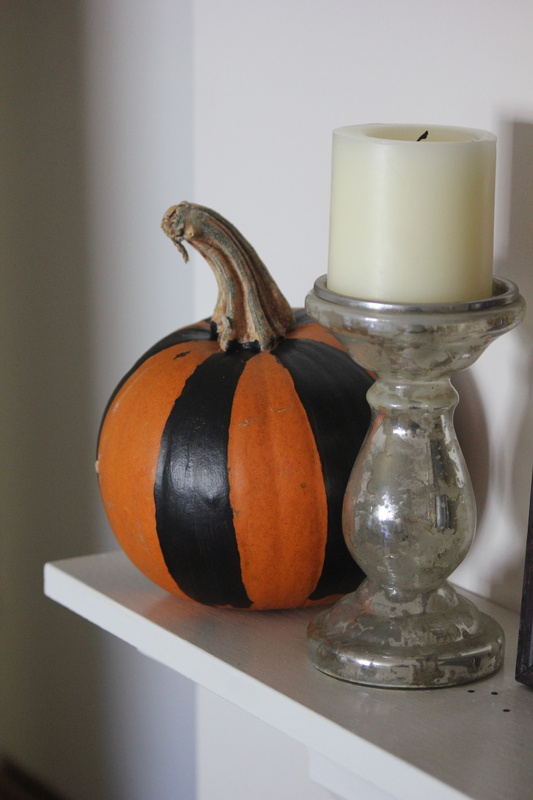 My first inspiration this fall came from a photo I saw on Southernliving.com – of painted pumpkins. I love the idea of carving pumpkins for Halloween – but in the end – it’s tedious, makes a mess and you have a rotten pumpkin in 24 hours. 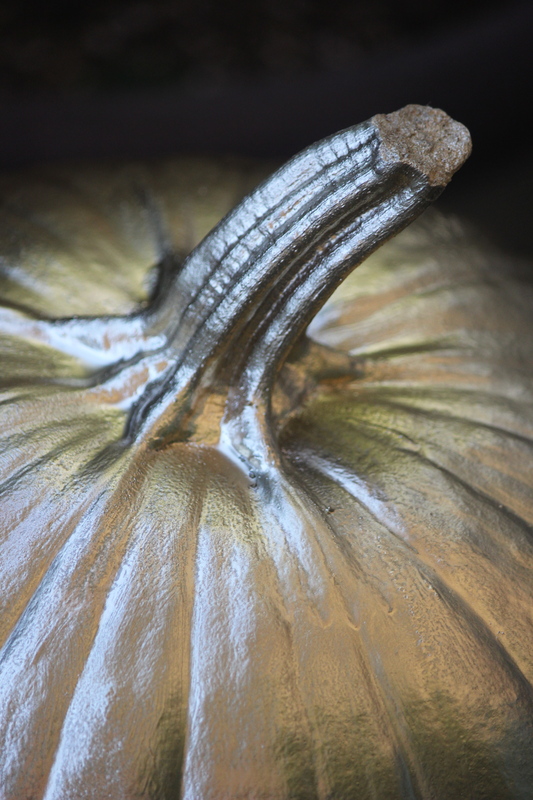 I’d prefer hang on to my pumpkin’s until Thanksgiving – so I chose to paint them this year! 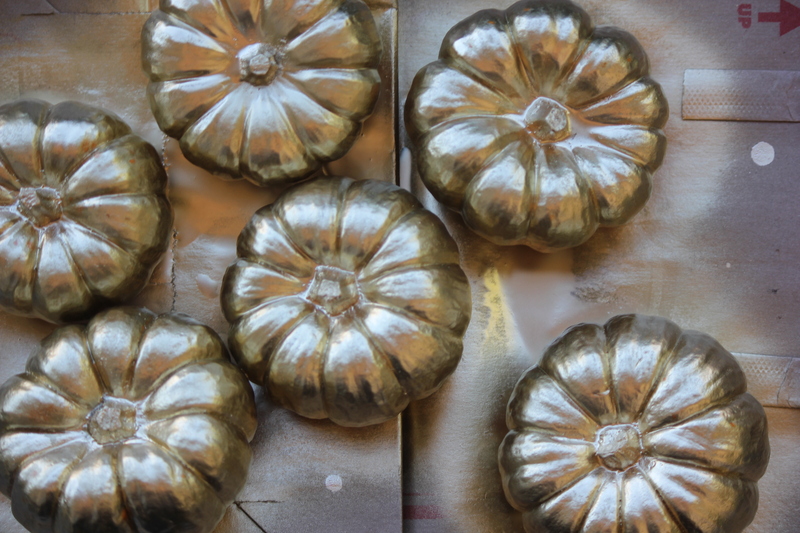 I used the Queen’s acrylic craft paint (Martha Stewart) – in gold metallic, and black. And the easiest way to paint uniform polka dots is to use round sponges! I love using these when painting signs too. 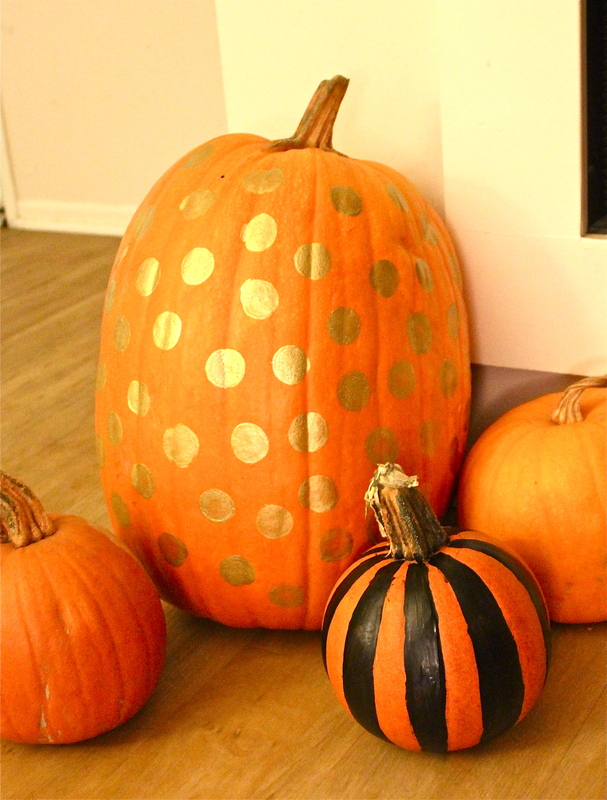 Check out Southern Living for more pumpkin decorating ideas! In this day and age, when long locks are coveted it’s almost impossible to keep your hair healthy. To make up for my everyday hair dryer and curling iron abuse, I started experimenting with hair masks. These are three that I love and totally recommend: Moroccanoil Intense Hydrating Mask, Bumble and Bumble Creme de Coco Masque, and your regular old, household extra virgin olive oil! Moroccanoil makes your hair smell like you just came from the salon while the Bumble and Bumble smells deliciously like coco! Both instructions suggest combing masks through damp hair and leaving in under 10 minutes before rinsing. I like to do it a little differently. I comb it through dry hair so I can really feel all the dry problem areas that need extra moister, put my hair in a bun, and leave it in overnight. If I don’t have a hair mask around I use the same technique with olive oil, which works just as well! To ensure my pillow cases stays nice and clean I’ll wrap a plastic bag around my hair and tie the handles on top of my head. 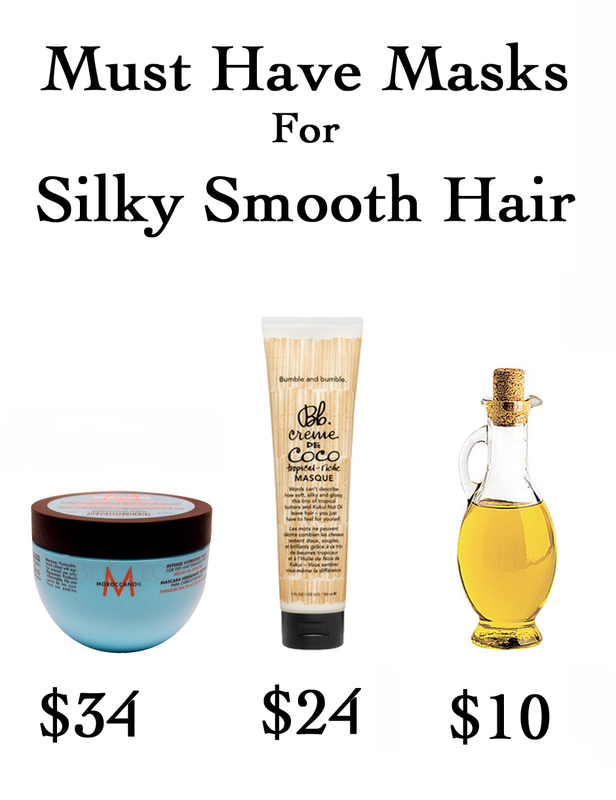 When I wake up, wash my hair, and start to blow dry I can instantly feel the silky difference! My hair is very thick so these masks don’t weigh my hair down, so be cautious with these if you have thin hair. Enjoy! 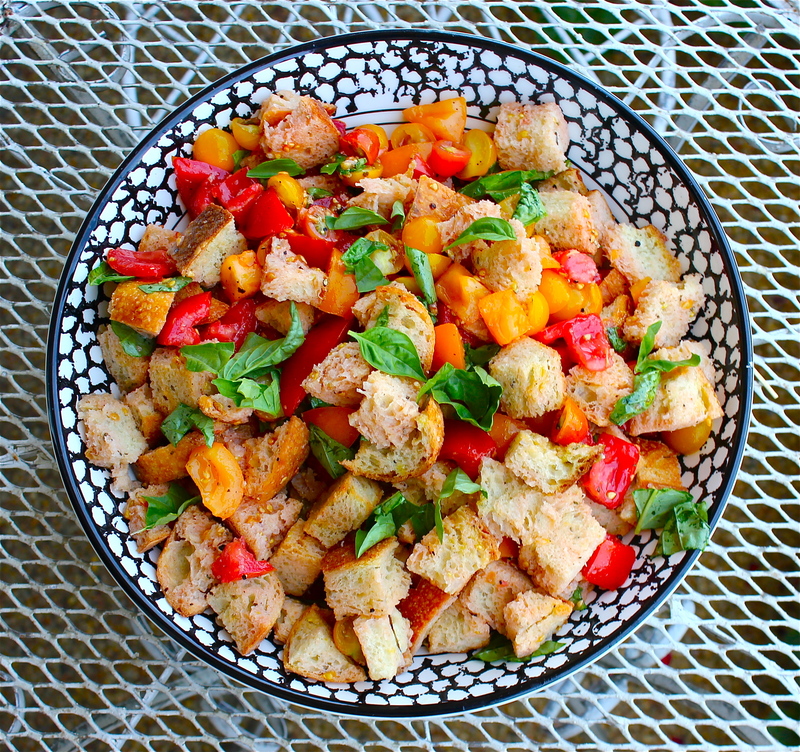 Panzanella is a classic Florentine dish that simply showcases old stale bread and the juices of plump, ripe, summer tomatoes. 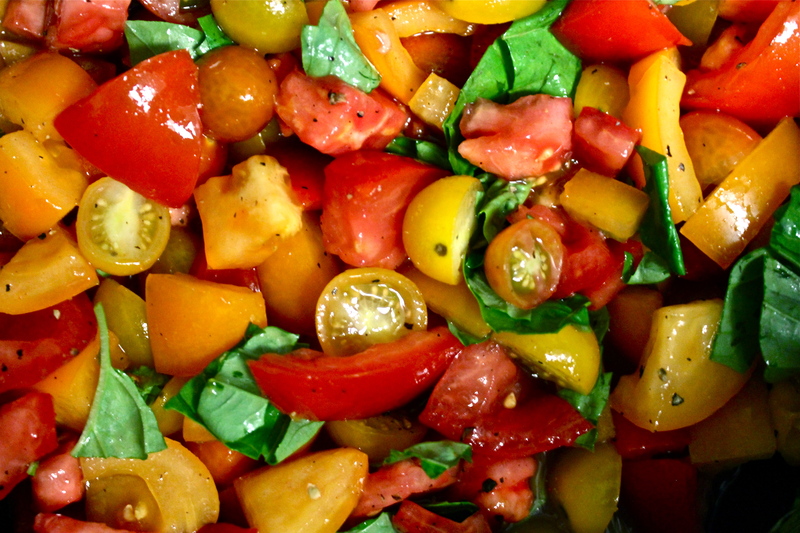 Since we are on the brink of tomato season I thought I’d share my favorite salad recipe! 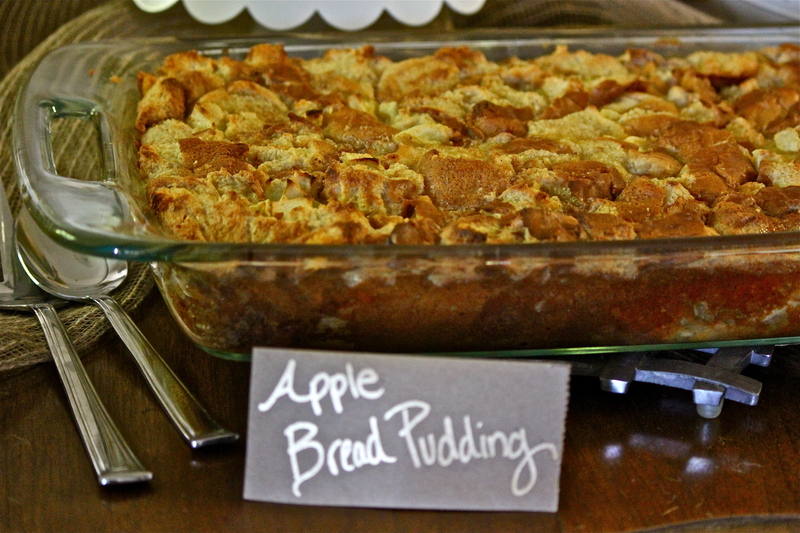 First things first, using stale bread is key or it will completely fall apart. 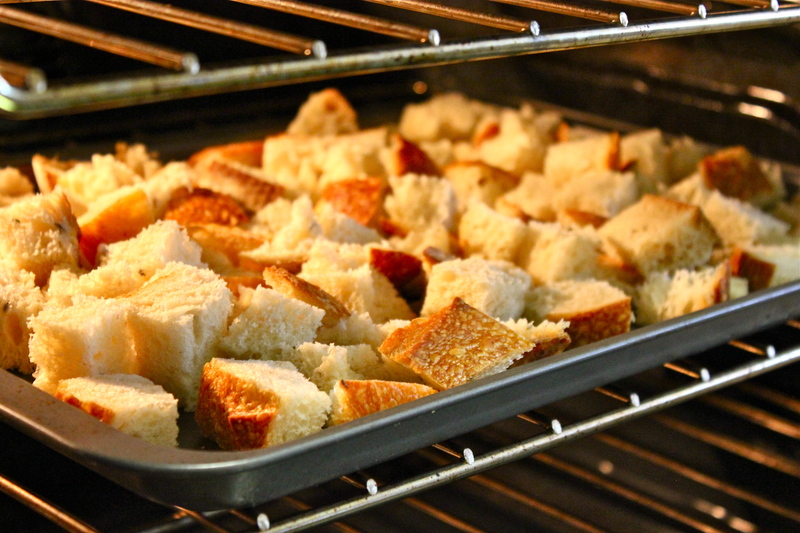 If you don’t have stale bread around the house, you can buy bread, cut it into 1 inch cubes and leave it out overnight, or pop it in the oven at 350 for about 5 minutes and it will be just fine. 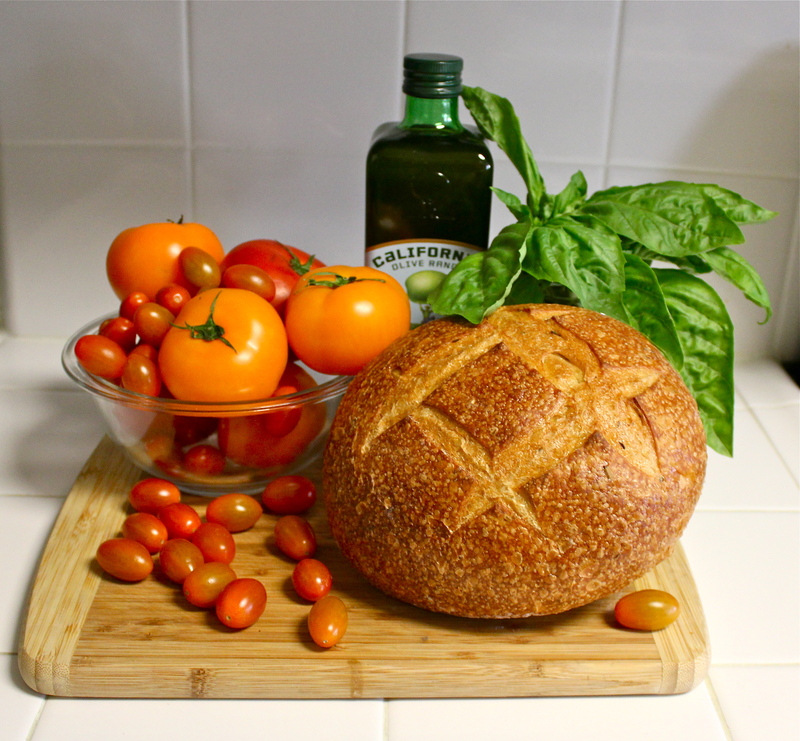 For my salad I chose a rosemary loaf just to add a little more Mediterranean flavor. Chop the tomatoes into nice large, but bite sized chunks and sprinkle with salt and pepper. Combine with chopped basil, salt and pepper and let sit for 10 minutes. 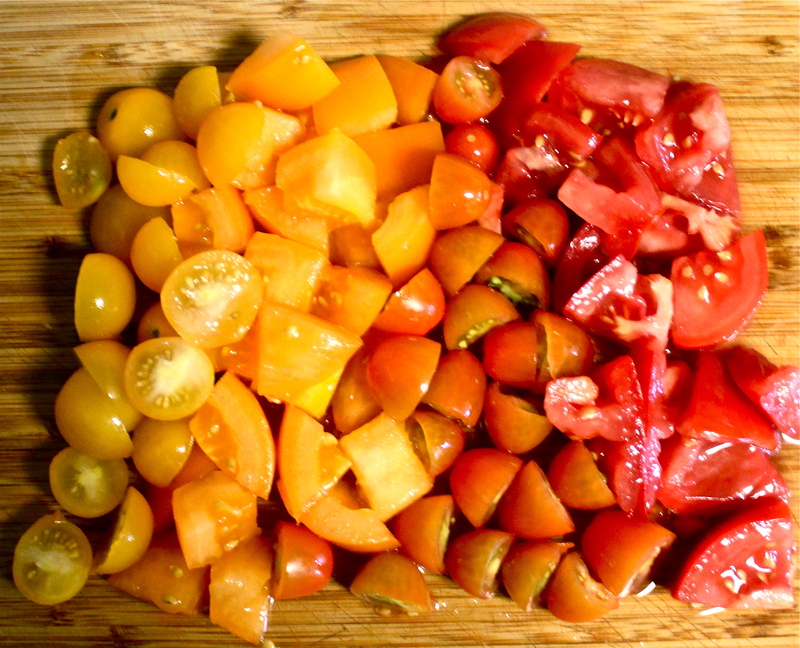 If your making this salad before prime tomato season they may need a little help so you can add a little but of red wine vinegar to add acidity and liquid that you would normally get with perfectly ripe tomatoes. 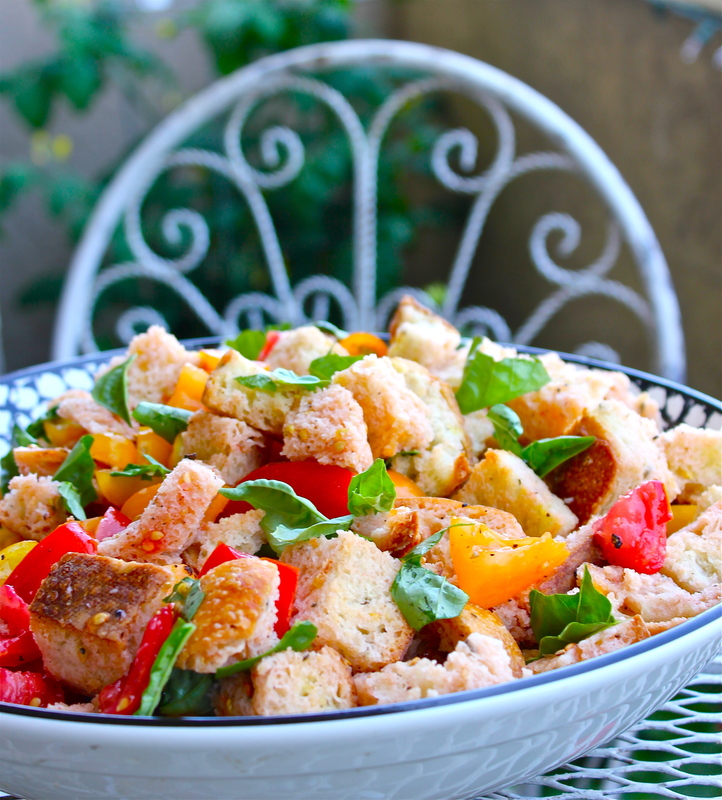 Combine tomatoes and bread, drizzle with olive oil and serve! I love the simplicity of just using these ingredients however some other fun things to throw in are cucumbers, artichokes, and capers! 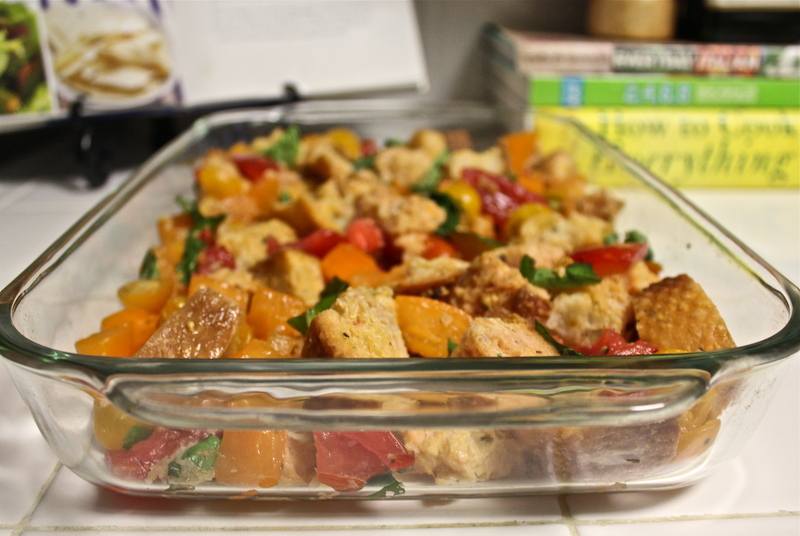 Also if you have a ton left over and the bread is getting really soggy you can throw it in a baking dish and cook for 20 minutes at 350 and you’ll have a warm savory bread pudding! 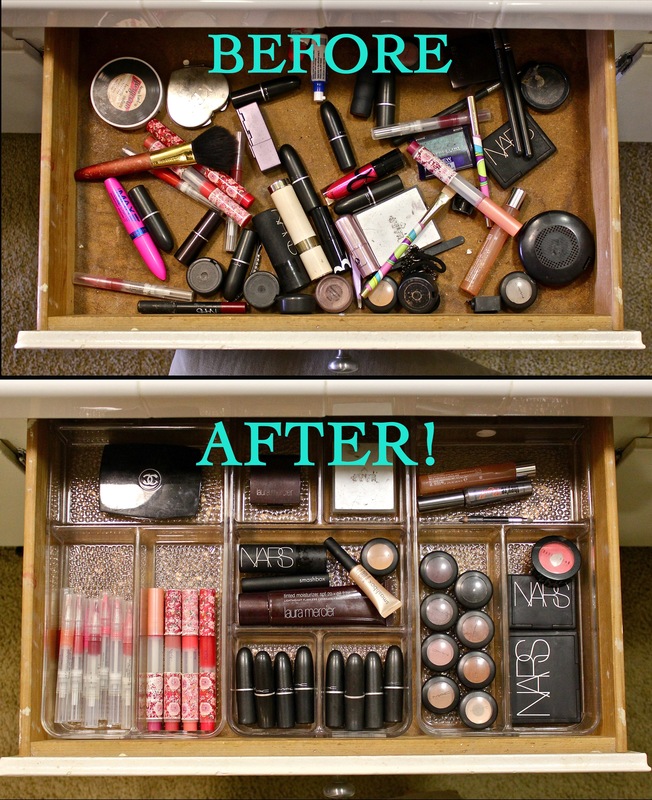 Drawer separators are amazing. 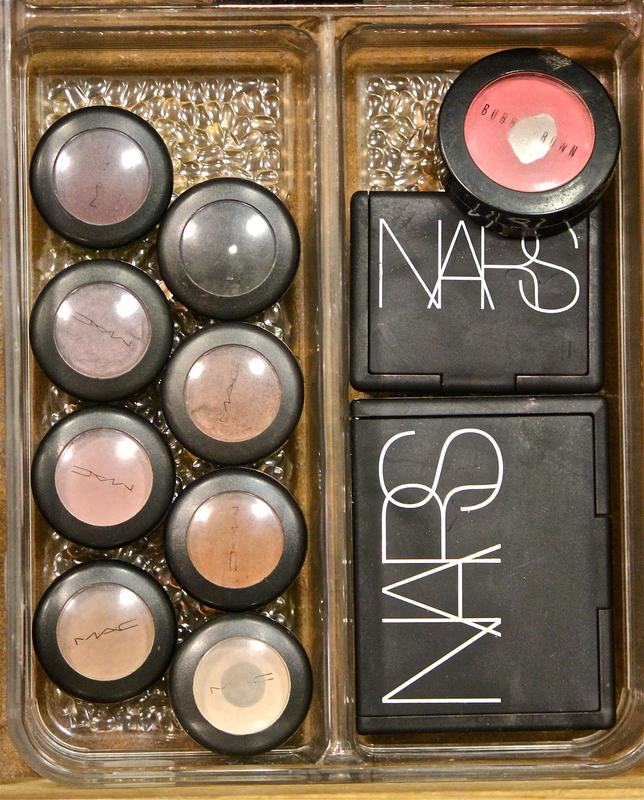 I found this one at Bed Bath and Beyond, and miraculously 3 of them fit perfectly into my vanity drawer! Now that I can actually see what makeup I have, I can get out of the house in the morning at least 10 minutes faster! Next drawer to organize is my kitchen accessories. 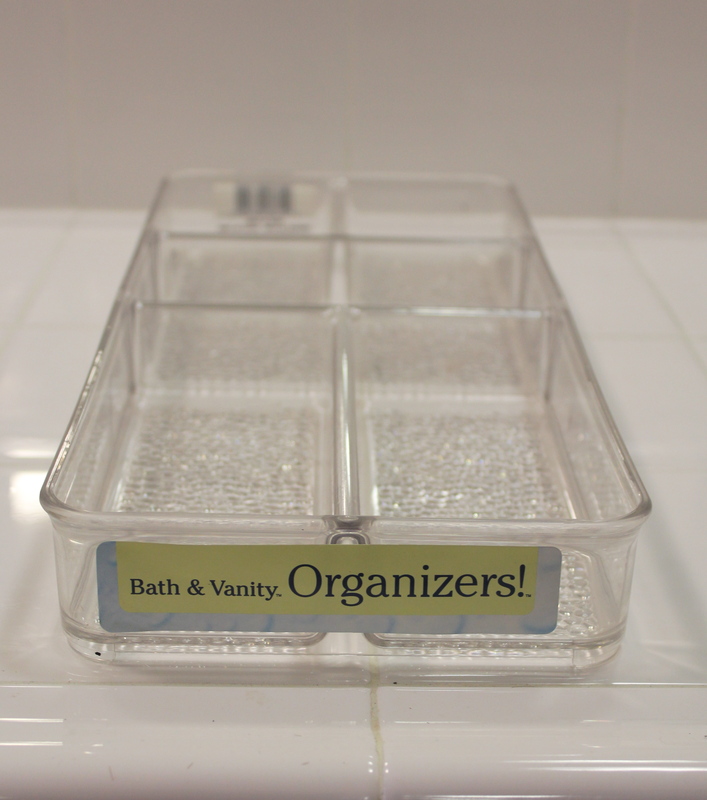 For that drawer you can use drawer separators without compartments to hold longer items like wooden spoons. I needed some cute work shoes fast, as I started a new job yesterday! I found these adorable polka dotted pairs at the Gap. Since I wear so many basic clothes to work, these shoes should go with pretty much any outfit. I like the cute quirky style that comes with the lace up oxfords, and the fun pop of color with the pointed classic flats. Totally impressed with Gaps shoe selection – they are fun, affordable, and who doesn’t love polka dots!? Drinking tea before bed is a time-honored tradition with the women in my family. As long as I can remember, my mom, aunts and grandmother always made a cup of Lipton‘s tea with a dash of milk – sometimes accompanied by a cookie. When my mom helped me move into my LA apartment, the first things she got at the grocery store were Lipton’s tea, milk and shortbread cookies. 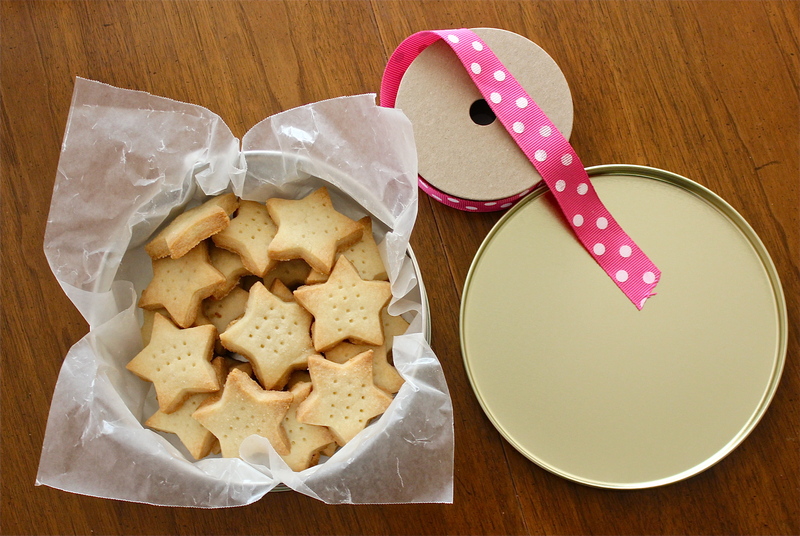 For this Mother’s Day, I thought I would make her some homemade shortbread cookies to enjoy with her nightly tea! 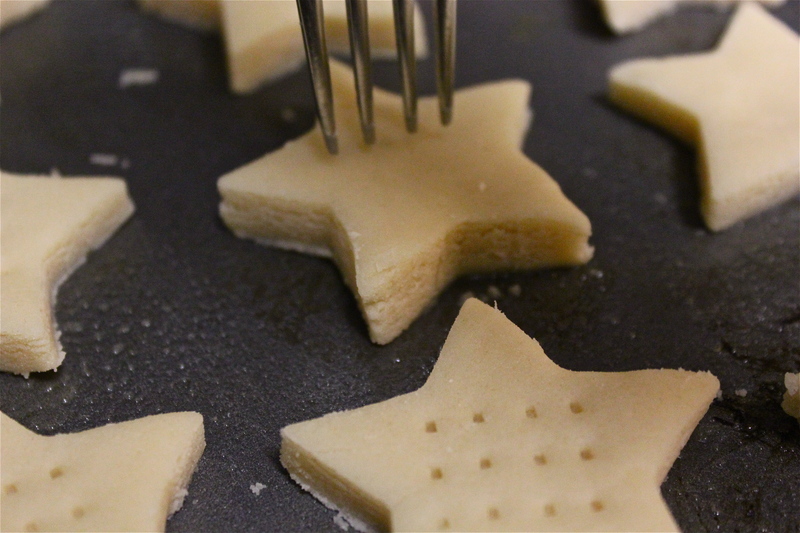 Luckily for me, shortbread is relatively easy to bake and only requires 3 ingredients! 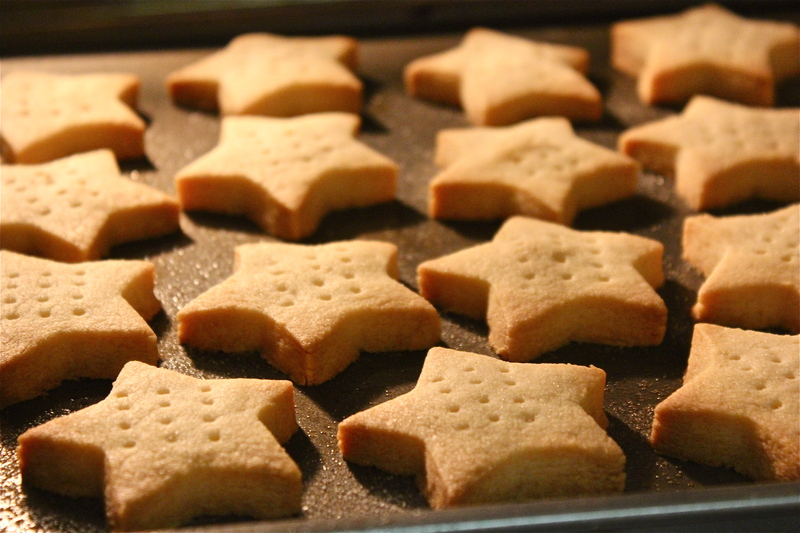 This recipe is based on Ina Garten‘s shortbread cookie. First mix the butter, sugar and vanilla with an electric mixer. In a separate bowl, sift together the flour and salt. 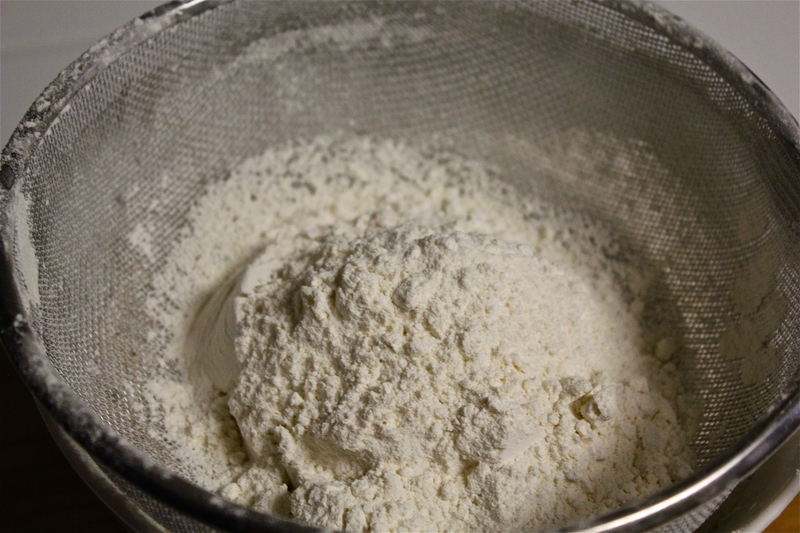 Sifting flour brought back my most vivid memories of my grandmother, or Grammy as I like to call her. 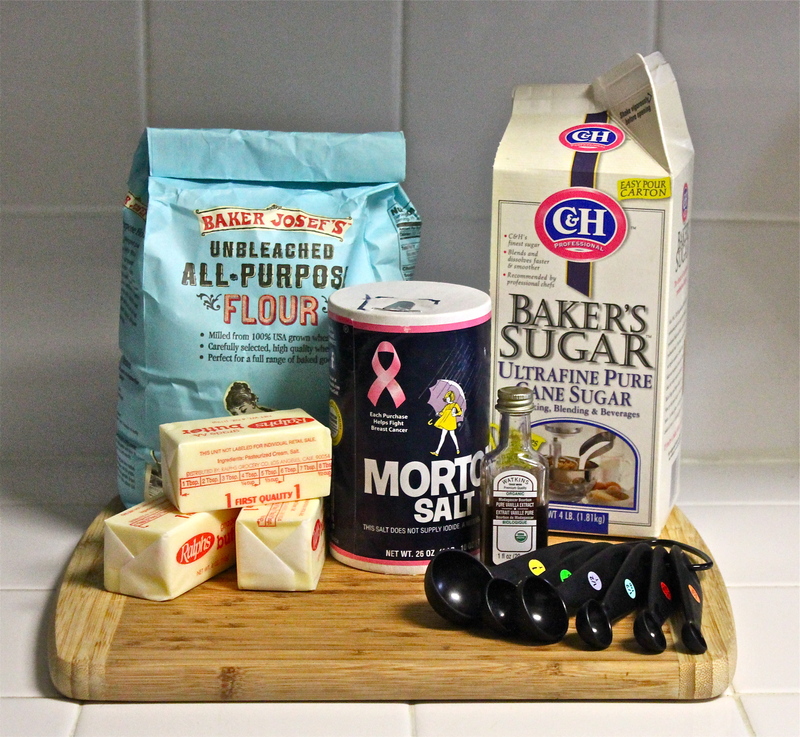 She was ALWAYS sifting flour, so I made sure not to skip this step, because who wants chunks of flour in their cookies? Thanks Grammy! 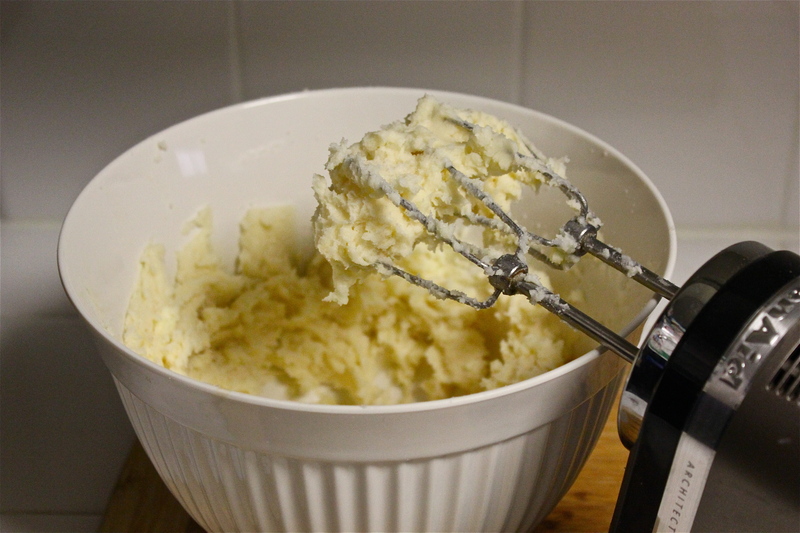 Combine the flour and butter mixtures until it comes together as a dough. Kneed together and wrap tightly with Saran Wrap and refrigerate for 20 minutes. 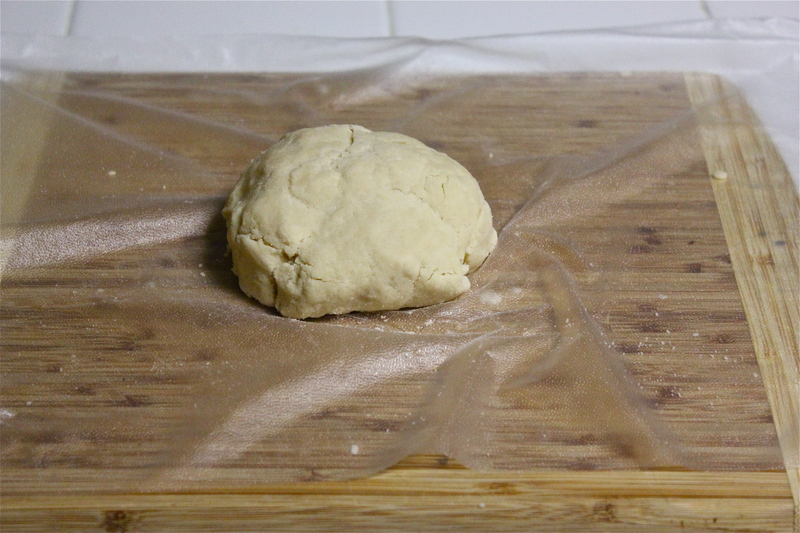 Cover rolling pin and cutting board with flower, and roll out the dough until its about 3/4 inch thick. 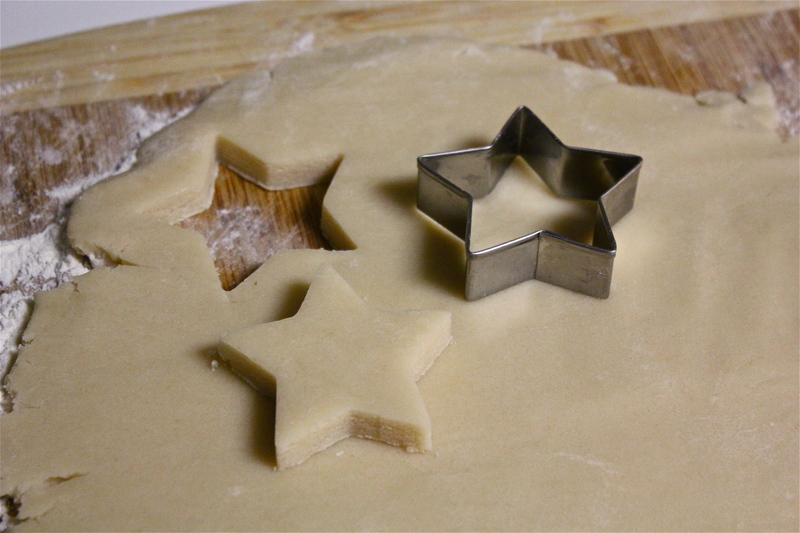 I picked out a cute little star cookie cutter for these cookies. 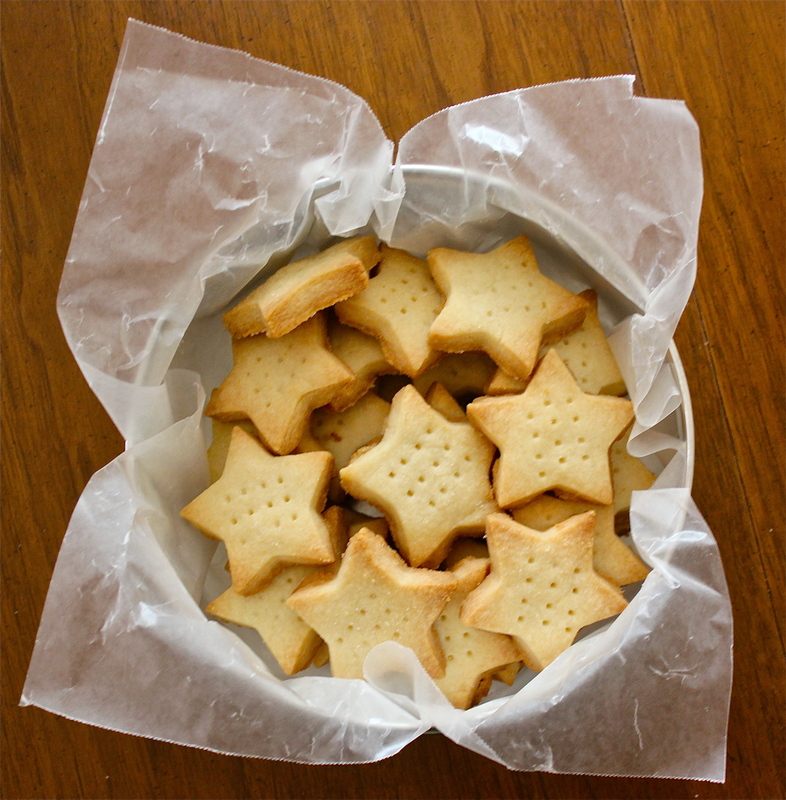 I think making smaller cookies is best, because shortbread is quite rich as it’s packed with butter! 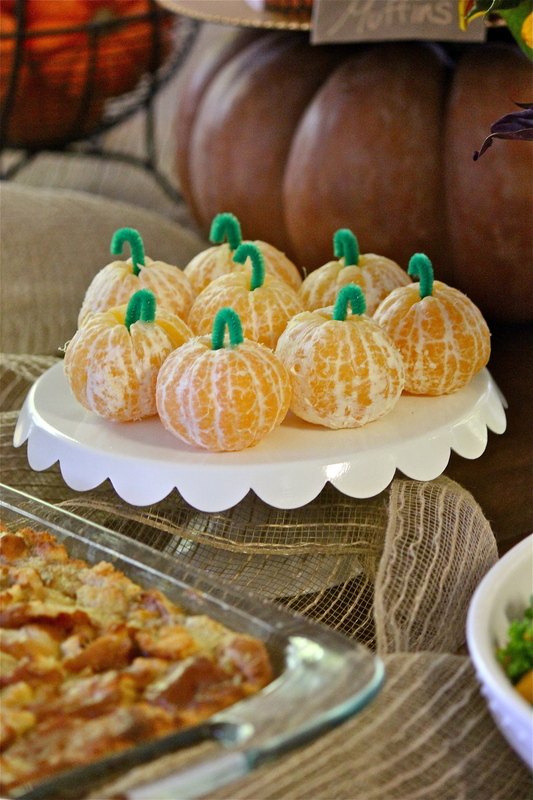 Cut out the cookies and arrange on an un-greased cookie sheet. 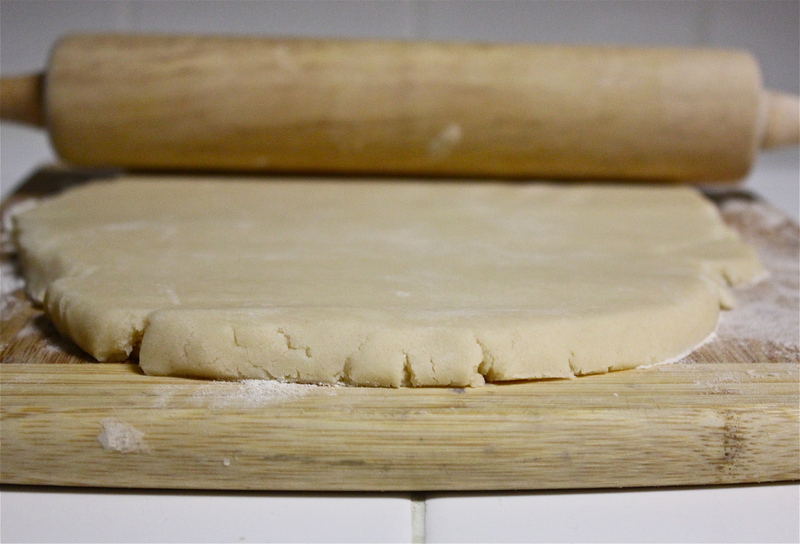 Greasing the cookie sheet causes the cookie to expand on the bottom, loosing their form. Since again, these cookies already have so much butter, they will pop right off the pan no greasing needed. They also don’t expand like other cookies while baking so you can fit a lot on your baking sheet without worry of overcrowding. 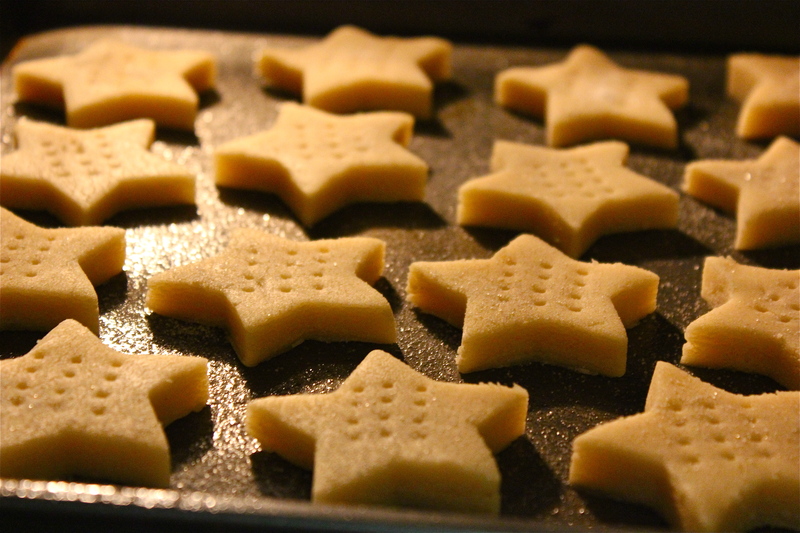 Traditional shortbread cookies have little dots in the middle, so I took a fork and pricked three times in the center of each cookie and sprinkled the tops with a little extra sugar. 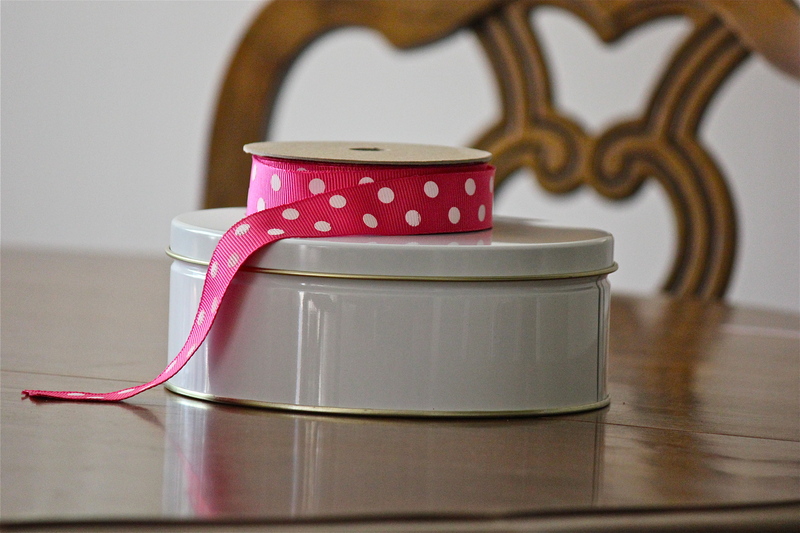 Since my mom lives in Sacramento, I found this adorable cookie tin and ribbon at the Container Store to send the shortbread in. 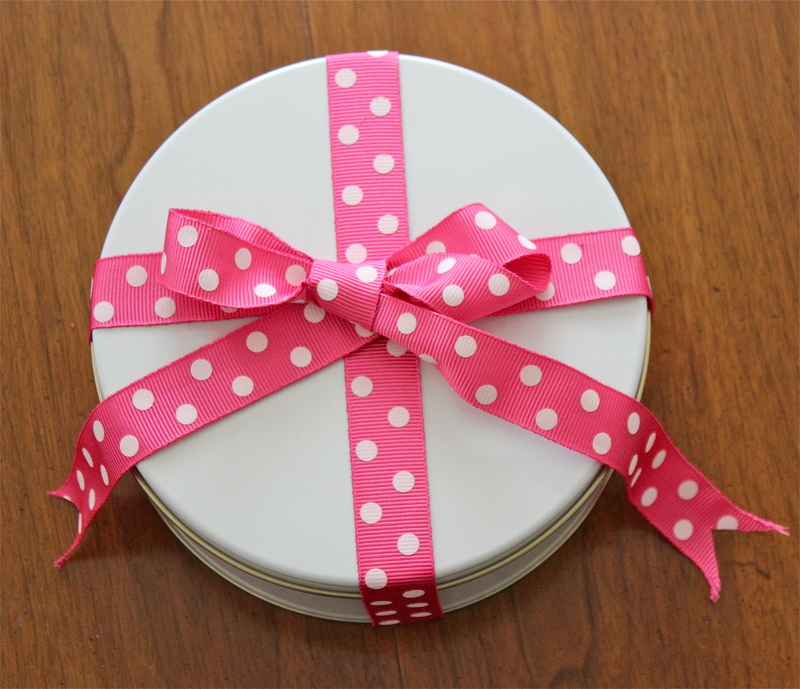 I lined it with wax paper, piled in the cookies and wrapped it all up in a pink polka-dot bow. 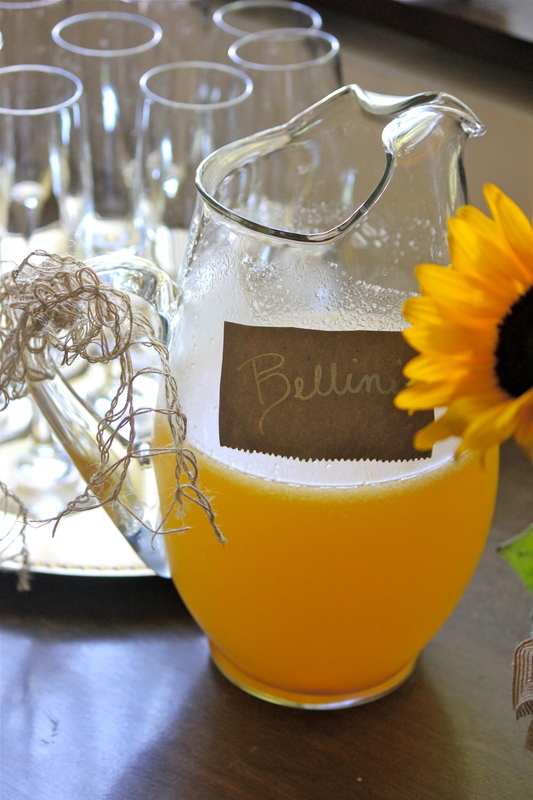 My mom is the inspiration for this blog. Even though she works countless hours as a pediatrician, she always makes time to tie the perfect bow, cook the best pot roast, throw unforgettable parties, arrange the pillows just right, and bake a three-tiered cake for my birthday no matter what. Her ability to balance her career and being a mom and homemaker so flawlessly is something I hope I can live up to. She is the epitome of style, class and poise and I’m lucky to have such an amazing role model. Happy Mother’s Day! 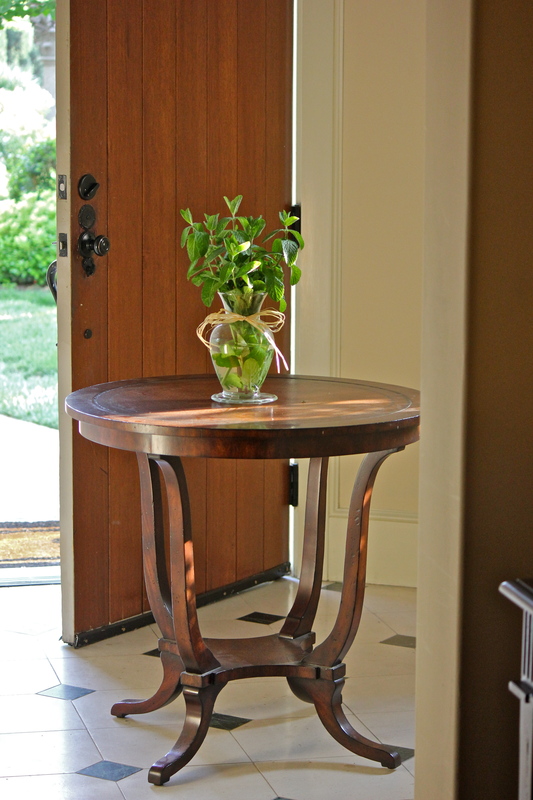 It’s great to mix it up a little by using herbs instead of flowers to decorate your home. 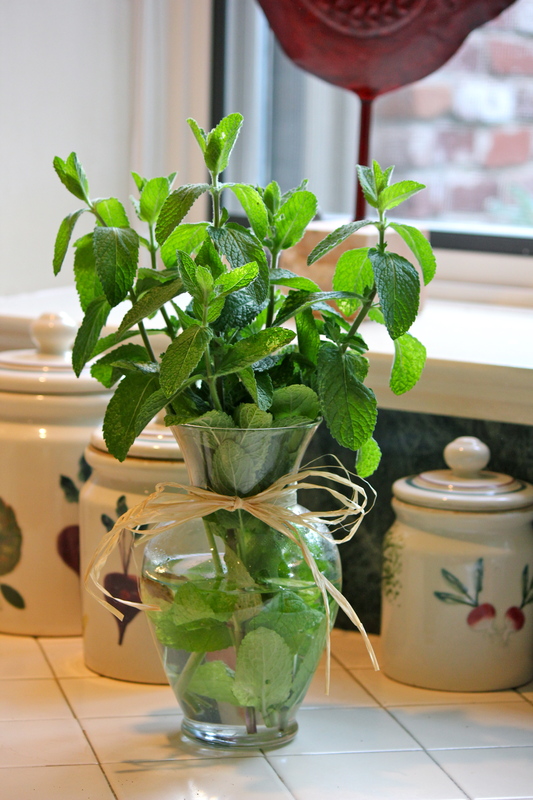 This mint makes a beautiful arrangement while also making your home smell amazing! 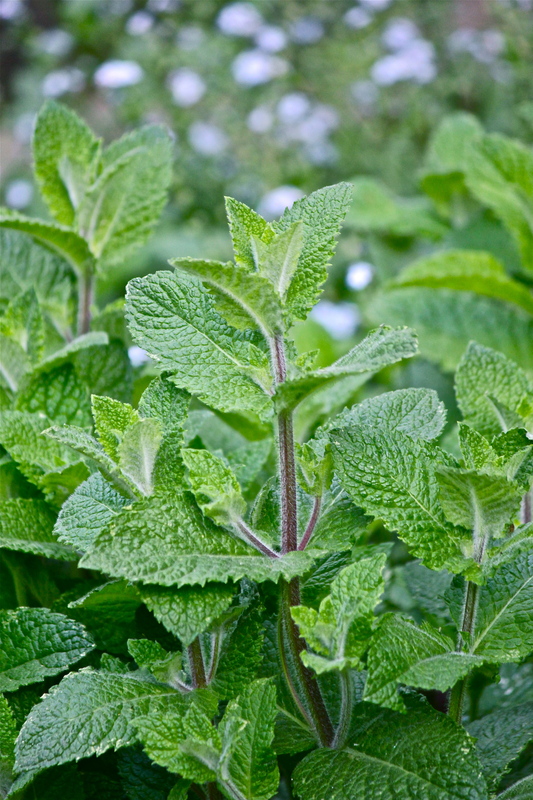 Mint is one of those plants that will keep growing and growing anywhere you plant it! You will have plenty to cook with and decorate with. Can’t wait to think of fun recipes to use the mint with! Any ideas?